The sound-check’s done and… we’re about to take centre stage. In 2015, we completed construction and opened the Award-winning Bella Concert Hall and the Taylor Centre for the Performing Arts. While it still has that ‘new theatre smell’ we’d like to amplify its acoustics by showcasing the finest local, national and international talent to play it. 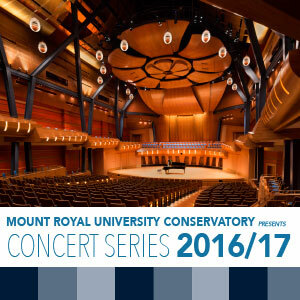 We would like to announce the debut of SEVEN CONCERT SERIES taking place at the versatile venues in the Mount Royal University Conservatory’s Taylor Centre for the Performing Arts in 2016-17. These concert events will showcase some of the most innovative contemporary artists to bring music to your ears. We want our MRU Insiders to be the first to know what’s up. Join us on May 13th, 2016 as we announce the line-up. This will take place at the James Ehnes concert, our final Wyatt Series event for this season. For tickets, go to tickets.mru.ca or call 403-440-7770. The Bella Concert Hall was built on sound. The Soundscape Series showcases the amplification of these artistic vibrations in their acoustic glory. * 5 concerts from local, national and international influential artists and ensembles. Importing world-class musicians from around the globe. Let’s give them a true Calgarian white-hatted welcome. * 5 concerts will take audiences on musical adventures in many musical genres. 2016 is the Year of Music in Calgary. 2017 is Canada’s 150th Birthday. What better way to celebrate our home and native land than to feature some of its finest artists. *5 concerts will define our country’s energy, diversity and talent. Our celebrated Wyatt Series continues to feature contemporary masters of classical works in performance and mentorship of our music students. This series honours the late Hal and Marnie Wyatt, longtime supporters of the Mount Royal University Conservatory. * 3 concerts from modern masters. Music, Speech Arts and Theatre are for all-ages. To ensure that the younger family members, and those who are young at heart, get to experience amazing music and storytelling, we have the Family Portrait Series. * 2 narrative shows that will inspire imaginations, whether it’s your first or ‘bazillionth’ time at a performance. The Spotlight Series showcases our diverse and talented instructors in performance. We’re so proud of our instructors, we want to bring their talents to centre stage. This monthly feature is as varied and exciting as the programs we offer. Historically, the Salon was a favourite meeting place for musicians of all styles to play, listen and collaborate. We’re bringing it back. Throughout the season, we’ll be offering these opportunities for folks to mix, mingle and enjoy a variety of musical entertainment. Of course, we’ll still be presenting concert events featuring all of our incredible performance ensembles and programs, including festive favourites Winter Fantasia and Sounds of the Season. Connect with us on social media for your chance to win tickets to each of the series, or the grand prize, seasons tickets to ALL concert events in our 2016-17 Season! Like, follow and spread the message to your friends and family. 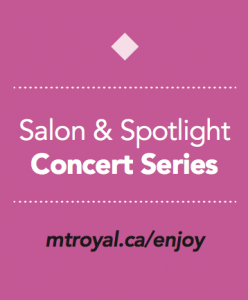 It’s going to be an inspiring season of sound at the Mount Royal University Conservatory! 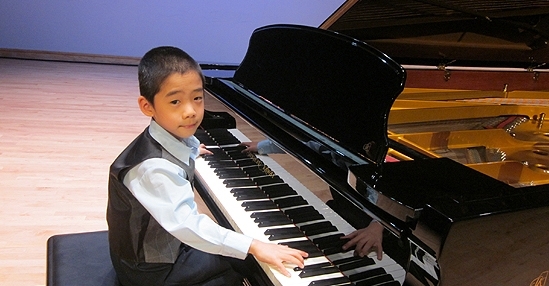 Each year, students from Mount Royal Conservatory compete in hundreds of classes at the Calgary Performing Arts Festival (formerly the Kiwanis Festival). By their estimation, 80 to 90 percent receive a combination of first and second place certificates. 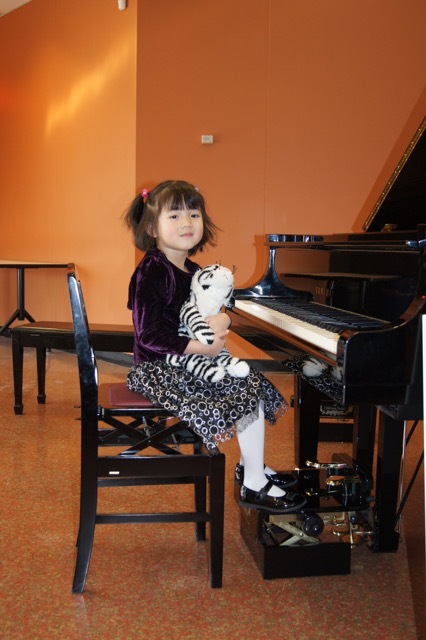 Pianist Charlotte Giraudeau is only 6 years old but is already an accomplished pianist, working with teacher Kathy Dornian in the Academy for Gifted Youth at the Conservatory. Charlotte has a sister, Madeleine, who also is a very talented student of the Academy for Gifted Youth. 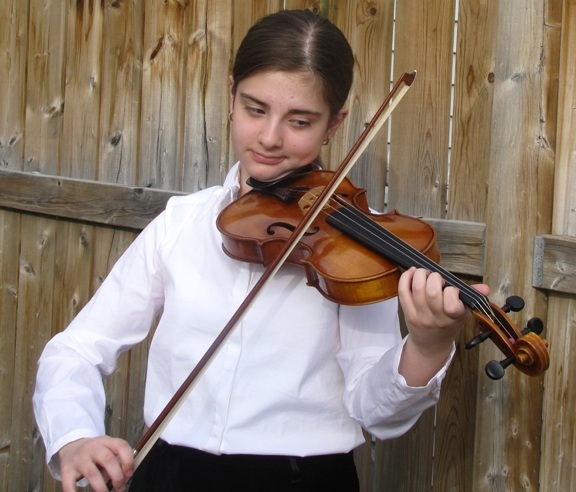 “Madeleine is 10 years old and playing at a Grade 9-10 level. She gave a stunning performance on March 11 of a very complex and difficult Canadian piece and won both the class and a scholarship. She competed in 5 classes, won 3 and placed second in 2,” says Kathy. Charlotte and Madeleine are both adopted from different orphanages in China and are completely unrelated biologically, yet both obviously have a very strong natural affinity for music. Their parents moved to Calgary from Edmonton a couple of years ago. 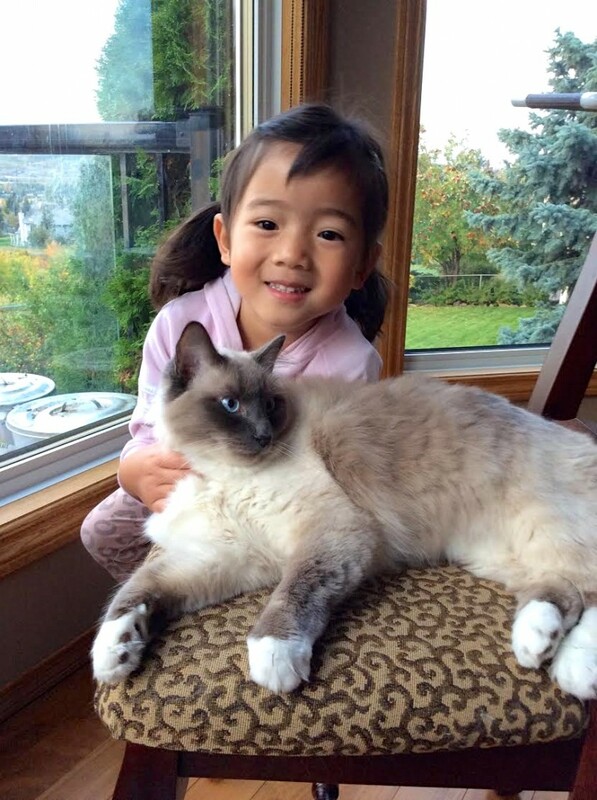 Their mother is Chinese, and their father is French. Here’s an amazing concert you won’t want to miss: two extraordinary Mount Royal Conservatory students — young pianist Kevin Chen, 9, and violinist Isabella Perron, 14, — are set to dazzle in High River Saturday, Sept. 20. 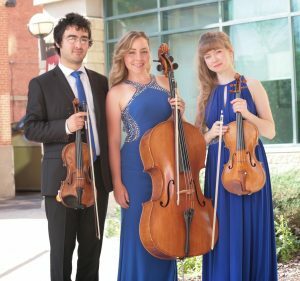 The Conservatory prodigies are opening the southern Alberta town’s annual High River Gift of Music concert series. 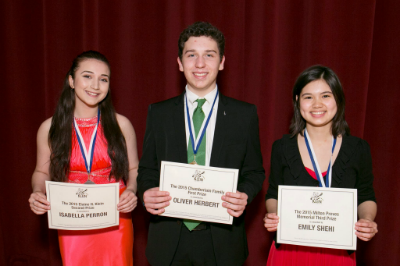 If you haven’t witnessed these gifted performers in concert, this is a great opportunity. 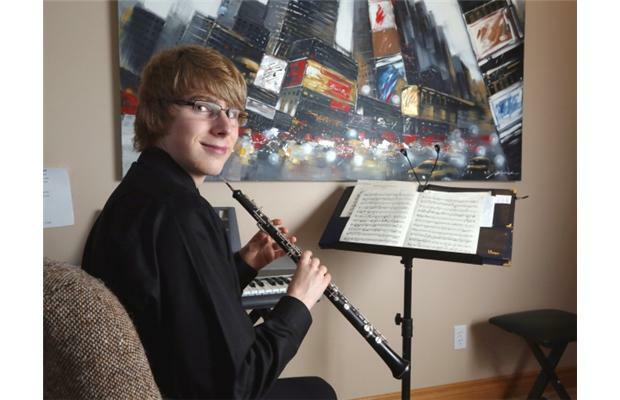 Conservatory alumnus Kevin will be performing the world premiere of his commissioned composition about the devastating 2013 southern Alberta flood, River Rhapsody. The full-scale, nine-minute piano piece reflects the flooding’s turmoil but also the resilience of the High River community. 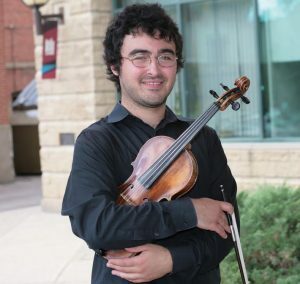 Kevin, a former Conservatory student of Colleen Athparia, has passed Canada’s ARCT piano teacher diploma exam and is currently studying at the Royal Conservatory of Music. Despite being nine years old, Kevin has composed many pieces (the Abbotsford Youth Orchestra played his Symphony No. 1 last year). He has said he hears music in his head, and enters it directly into his computer. Isabella is a gifted and award-winning violinist, singer, and pianist who competes nationally. Described as a complete musician, Isabella is highly regarded for her stage presence, spark and musical spirit. 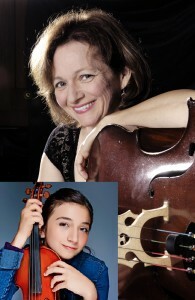 Isabella comes by these talents naturally: her mother, noted Montreal concert cellist Johanne Perron, teaches master classes and lessons at Mount Royal Conservatory. 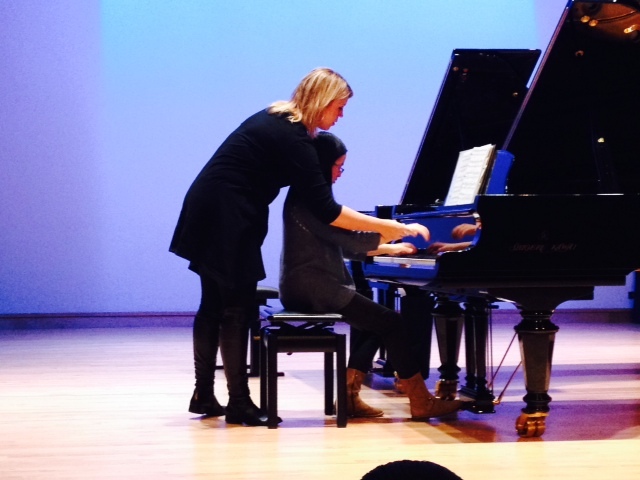 The Conservatory’s Academy for Gifted Youth students enjoyed a once-in-a-lifetime masterclass with pianist Gabriela Montero March 30, 2014. The Wyatt Artist in Residence Series performer played to a full theatre April 1. 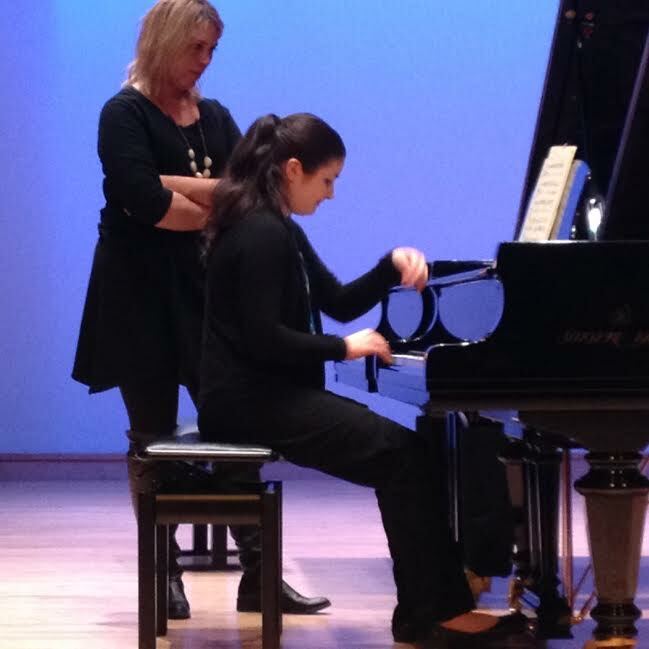 Classical and improvisational pianist Gabriela Montero did more than delight a capacity crowd at her April 1, 2014 recital at Mount Royal University’s Leacock Theatre. The Wyatt Artist in Residence performer inspired our Academy for Gifted Youth students through a day of masterclasses March 30. What’s it like playing for one of the world’s most gifted musicians? Q: What was it like playing for Gabriela Montero? A: It was a great experience, it was especially interesting as I chose to play the C Major Schumann Fantasy without realizing it was on the program for her recital that evening. She mentioned that it is amongst her top five favourite pieces and obviously had a deep understanding of it, which made for a great lesson. Q: What was the best advice you took away? A: I’d have to say her approach of technique and being as efficient and relaxed as possible in every movement at the piano. Jenny Z. has been an Academy student for two years, and is currently an APP student. The talented 16-year-old studies with Krzysztof Jablonski. 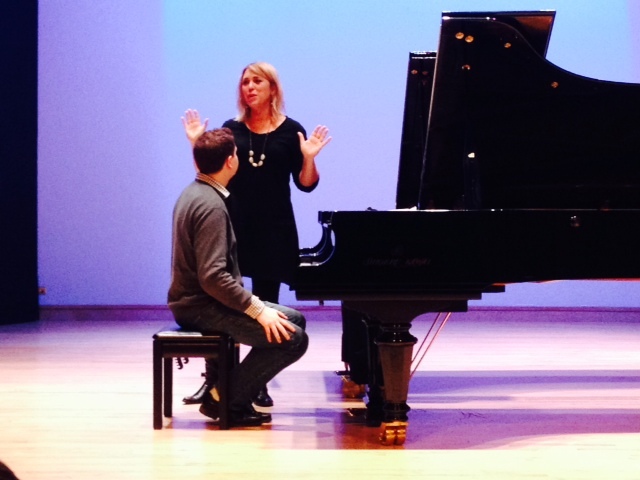 Q: What piece did you perform for your masterclass with Gabriela Montero? Q: What was the most important lesson she taught you? A: She offered a lot of technical advice (since we mainly focused on technique), and the major one is: it is best to limit your movements to only what is necessary to produce the sound, because we essentially play by gravity, and once the key is pressed, any extra movements won’t affect the sound. In addition, the closer your fingers are to the keyboard, the more control you have on producing the sound. Even if you feel you need to move “with the music,” like lifting your wrist before beginning the next phrase, just think of how the music goes inside and don’t let it affect your movements. Q: What was it like working with such a famous classical musician? 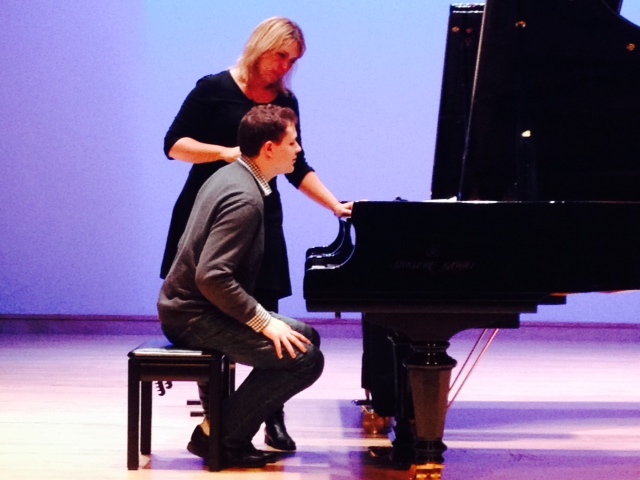 A: It’s a great privilege to learn from a world-class pianist. At first, I felt a bit nervous and curious to see what she would say, but in the end, her confidence and knowledge gives me confidence as well: I know I learned something that would definitely improve my performance skills in general. It is also illuminative, as she would mention something that I never thought of, and sometimes what she teaches also converges with my teacher’s words. Q: Which piece did you perform? Q: What was the best advice from Gabriela Montero? A: Don’t try to play the piano with a lot of extra motion, or with no motion at all. When you play the piano you should play it and be. It’s like walking, when you walk you don’t walk with stiff legs, but you also don’t walk like you don’t have any bones. You just walk. I thought that was very helpful. Q: What was the experience of playing for a renowned musical star for the day? A: I thought it was really cool! It was a great experience, I am very lucky to have had it! That is one of the things I really like about the Academy Program at Mount Royal, you get to have some great once-in-a-lifetime experiences that not a lot of people can have, so I feel really lucky to be one of the students working with these wonderful guest artists. WATCH” frameborder=”0″ allowfullscreen> baritone Russell Braun offering his advice to our Academy students. NOTEWORTHY: Season subscriptions to the Wyatt Artist in Residence Series Recitals support the Conservatory’s Academy for Gifted Youth program. A chance stop at a garage sale while riding her bicycle last summer is paying off for Kate Phernambucq. The 14-year-old spotted a used ukulele and just couldn’t resist. It was the best $10 she’s ever spent. 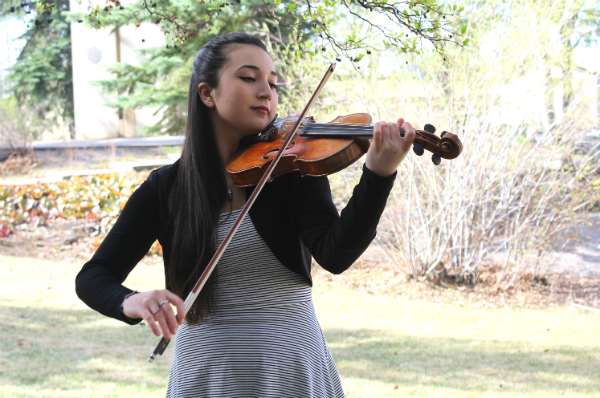 Teaching herself to play the instrument has become more than a hobby for the Mount Royal Conservatory speech arts and vocal student. It’s become a songwriting tool. 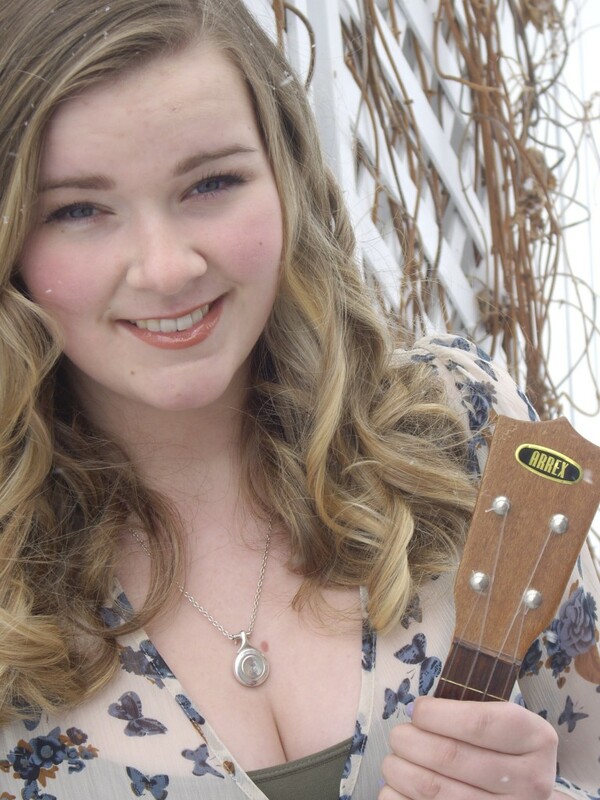 Now, the talented teen is vying for a top spot on CBC’s Searchlight competition – she’s hoping to get enough online votes for the grand prize. “It’s been like a firestarter for me,” said Kate, who chatted with us en route to class. While she’s new to strings, Kate has packed a lot of formal musical education into her 14 years. She got her musical start as a Kodaly student. Since 2004, Kate has studied harp, voice and speech arts with the Conservatory. Kate says her years studying drama and speech arts has given her the confidence to perform, most recently at a local café’s open mic night to showcase new songs. “I love the energy from the audience, and I just love performing,” she said. 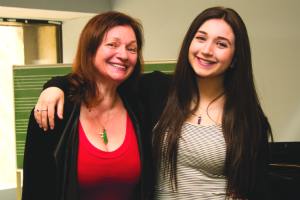 Her mother, Lisa, says early childhood music was always a priority for Kate and sister Emily, a former Academy student and national award-winning flutist now studying music at university. Having both students grow with the Conservatory through the years shows that music and speech arts sets young people up for success. Joined by Edward Powell (violin) and Karen Neary (piano), Phoebe Powell showcases the harp’s capacity to depict musical character, structure, and emotion with melodious eloquence and incisive contrapuntal clarity. -and the alternately lush and puckish moods of Debussy‘s seductive Danses sacrées et profanes for harp and piano! 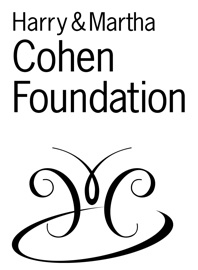 This concert is the final performance in a series of six performances this season by Emerging Young Artists presented with the generous support of the Harry and Martha Cohen Foundation.